Takeaway: Setting up self-directed work teams ensures that workers look out for each others' safety. 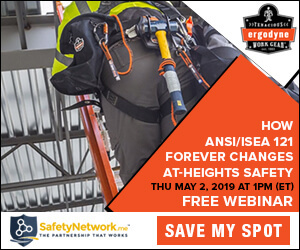 Would you like to take safety to the next level? Consider creating self-directed work teams. We're social beings, so naturally we do better as a group. If you don’t have formal teams, you probably have some informal ones – we call those cliques. Before I explain what makes a self-directed work team, let me give you an example of one. Pick any sports team – soccer, hockey, baseball, football, anything. These are self-directed teams. They must be to influence the game (see 7 Tips for Making Safety a Team Effort for related reading). I'll use basketball as my example. The five players on the court represent the self-directed team. They have rules and parameters they must obey, but they also have the freedom to respond to the conditions of the game and the actions of the opposing team. Players don’t have to ask permission before passing the ball or taking a shot. You will never see a micro-managed sports team. There may be a lesson here! Imagine you have 100 employees. Promoting safety from the top down will be difficult. Telling 100 people to work safe doesn't quite speak to the individual. How do you eat an elephant? One bite at a time. You need manageable chunks. In the workplace, that means you need teams. You can create teams from departments or groups that share similar work and tasks. In a restaurant, one team could be the kitchen staff, and the wait staff could be another. For manufacturing, it could be by production cells or departments. In construction, work crews can become teams. We want to give those teams ownership for driving safety and other key performance indicators such as cost, quality, delivery (find out How Leading Indicators Can Make Your Workplace Safer). We are making everyone a safety leader for their team. This is a decentralized command, and it works through empowerment and self-management. When a team takes ownership of their area, amazing things happen. We want to succeed at targets set for our team, including safety. People don’t like being told what to do. We would rather be told what the problem is and given the opportunity to solve it. We want to self-manage and not be micro-managed. Teams can rotate safety responsibilities such as weekly safety monitors, performing hazard assessments, and reviewing safety checks. We have a deeply human need to control our own lives. This is fundamental to our sense of health and wellbeing. Managers need to provide the goals or targets for the teams and provide the needed resources and support for success. Managers should emulate coaches, not bosses. That's the best way to make sure team members feel valued for their contributions (see From Teflon to Coach: A Lesson in Effectiveness for more). It's no wonder, then, that people find themselves happier, more fulfilled, and more creative in team-based environments. We live in communities and families because we have a deep need to belong, to feel loyalty and trust. So, why not build genuine communities in the workplace? After all, we must feel safe emotionally before we can be safe physically (learn more about The Three Levels of Safety). How can we accomplish this? Well, we work with our head, heart, and hands. You can teach people to work with their hands, but you must inspire for their heart and earn the engagement of their mind. Team-building is a great way to inspire the heart. It inspires us to protect others, often better than we protect ourselves. It makes us our brothers and sisters' keepers. I know I want the safety that only a team can provide. How about you?